Calling all lemon lovers! 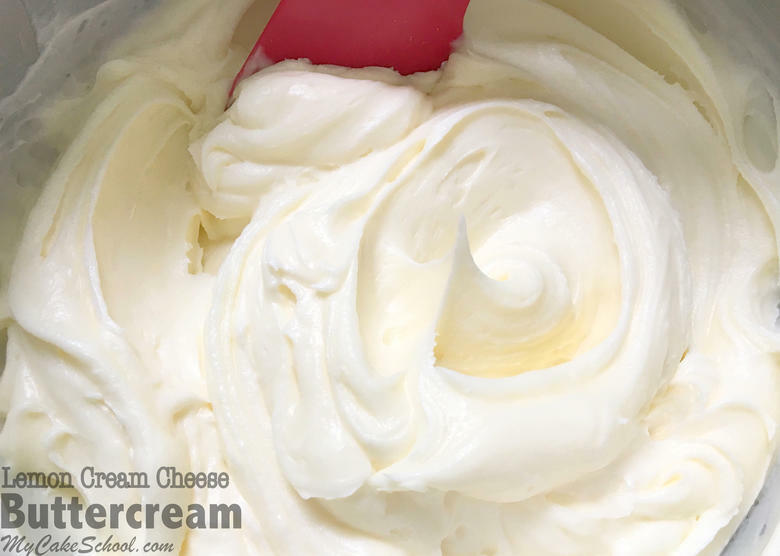 You are going to fall in love with this DELICIOUS Lemon Cream Cheese Buttercream Recipe. It is the perfect lemony, light and flavorful complement to white, yellow, citrus, and even coconut cakes! I love cream cheese frostings and this recipe is no exception. In fact, of all of the cream cheese frosting variations that I’ve made over the years, this Lemon Cream Cheese Buttercream recipe is one of my all time favorites! I love the silky smooth consistency and it has the perfect amount of lemon. 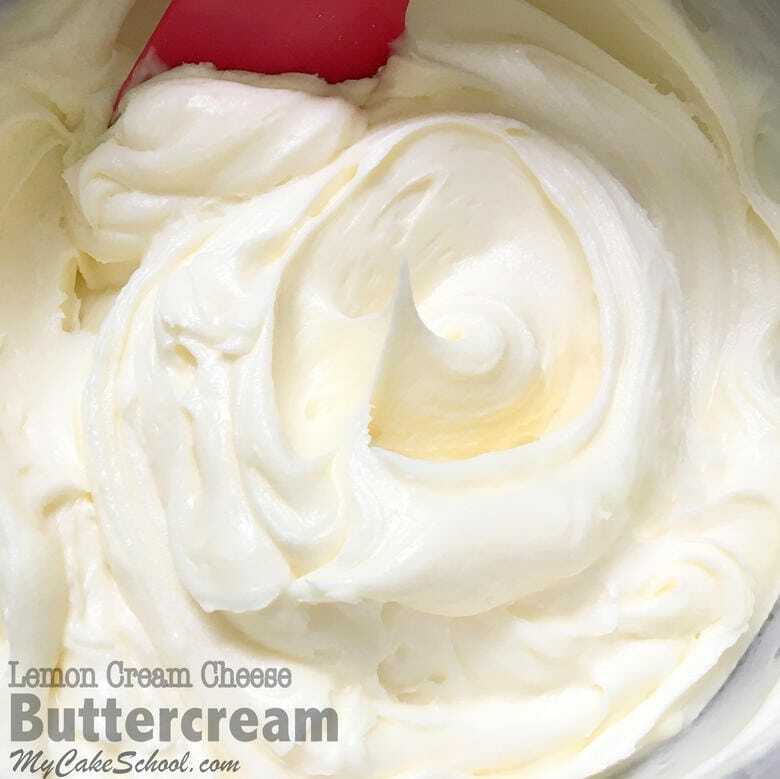 Even better, this Lemon Cream Cheese buttercream it is SO simple to make. We especially love it with our homemade Lemon Cake Recipe. Whenever we make a bowl of this amazing lemony cream cheese deliciousness, it’s a struggle not to eat it by the spoonful! In fact, I would highly recommend doing just that. Mmmmmmm… just look! You will love this Lemon Cream Cheese Buttercream for frosting and filling your cakes and cupcakes. It is fairly soft at room temperature and so it pipes best when slightly chilled. Love Lemon? Don’t miss our scratch Lemon Cake Recipe which is filled with delicious Lemon Curd Filling and Frosted with Lemon Cream Cheese Buttercream. YUM! Or, if you are looking for a Lemon Frosting recipe that is less perishable, this Lemon Buttercream Frosting recipe has wonderful lemon flavor and can safely be kept at room temperature for a day or two! We love how easily it pipes! 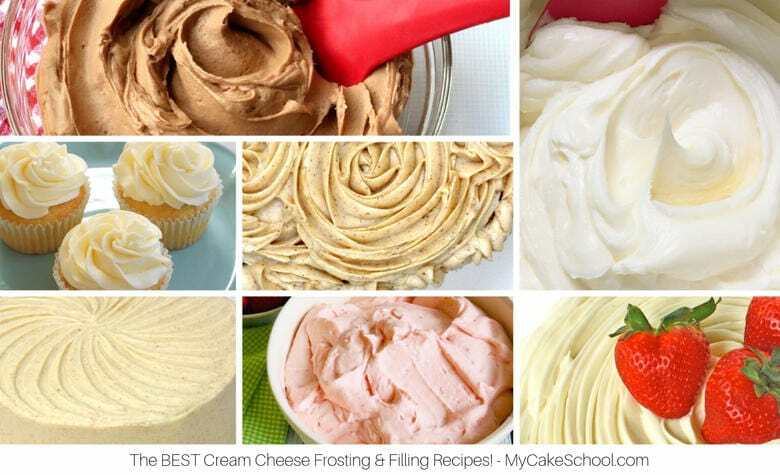 If you Love Cream Cheese Frostings, Don’t Miss our Roundup of Favorite Cream Cheese Frosting & Filling Recipes! This lemon cream cheese frosting has amazing flavor is and so easy to make! Cut butter into 1/2 inch slices and add to the bowl of your mixer, beat until smooth. Cut the cream cheese into pieces and add to the butter, beating until blended. Add the lemon juice and lemon zest. 1 teaspoon lemon extract, optional for a stronger lemon flavor. Gradually add powdered sugar and beat until well blended. This frosting will pipe best if used while still chilled. You can make it in advance, refrigerate and when ready to use let it soften slightly and remix. Do not microwave to soften. Will frost a 3 layer 8 or 9 inch cake. **Don’t miss our full collection of favorite tried and true recipes for cakes, frostings, and fillings in our Recipes Section! If you’re interested in simple and creative free step by step cake tutorials, we’d love for you to check out our Free Tutorials Section. But, when I wanted to decirated the cake, the frosting was too soft to be spread it or make the rosette decoration om the side. And the funny part is that I put my frosting on the freezer. What to do next time to stabilize the frosteing and don’t melt. The frosting is was delicious. Hi Trianny, I am sorry you had a problem. Did you use full fat cream cheese? Do not use reduced fat or cream cheese in the tub containers. Possibly the ingredients were not cold enough. If the frosting becomes too soft, putting it in the refrigerator for a short while will firm it up again for piping on the rosettes. Some people have very warm hands and when holding the piping bag it will cause the frosting to become too soft. If this happens to you, you can fill two piping bags keeping one in the refrigerator and piping with the other one. When the frosting in one bag becomes too soft just put in the refrigerator and pipe with the cold one. We have never used anything to stabilize the frosting. I hope this helps. Thank you! Probably it was the butter was not cold enough. I used the regular cream cheese. Maybe the bag and hands were warm too, because after I got the frosting from the freezer, and started making the rosettes, later I saw they started melting. Thank you for the advise.! Hello. How will this icing do under fondant?? Hello. How will this icing and your lemon cake do under fondant?? Is the cake sturdy enough?? Hi Michelle, The cake is sturdy enough for fondant but the lemon cream cheese frosting should not be used under fondant. I am super excited to try this for a coworkers birthday. I LOVE lemon and I’m afraid the curd and frosting might not make it to the cake. LOL! Hi Babs, so glad that you’re making it! Hi I have baked your pink lemonade cake doubling the recipe so I have 4 layers(8 in), do I need to double the icing if I want to pipe rosettes after crumb coat as well? 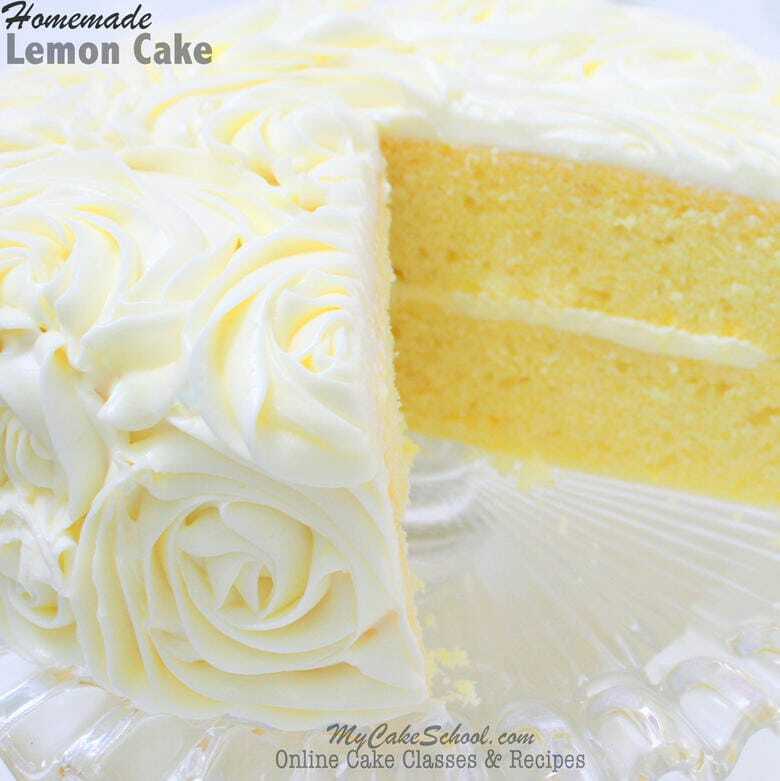 Rosettes all Over the sides and top of the cake like in the picture for your lemon cake. Hi Olga, I would probably double just to be on the safe side. If you have leftover, it freezes well. This looks yummy, but I’m wondering about high altitude adjustments. I live at 6900 feet. Hi Melissa, thanks for this recipe, I can’t wait to make it. But in Australia we only have the cream cheese in a tub (Philadelphia or Philly etc) – I want to pipe rosettes all over and assume the icing will therefore be too soft to hold. What adjustments or substitutions can I make to offset the wrong cream cheese? Many thanks! First buttercream I’ve ever made! It was amazing. I used 4 tsp of lemon juice and no extract. I also added some Kosher salt to cut the sweet a bit. It was so wonderful! Thank you! Hi D. Amato, That is wonderful, I’m so happy you gave it a try. Thanks for posting! !